This is not my first attempt at writing max script, I've hacked a ittle around the edges with adding custom attributes - Thanks PEN - but this is my first attempt at a useful/functional tool. 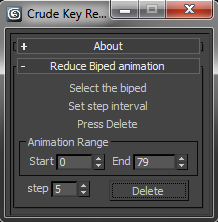 Reduce Your Transform Keys is designed to strip away all the transforms that don't do anything. By default the range is set to your current animation range but you can confine the key pruning to a specific region for your timeline.